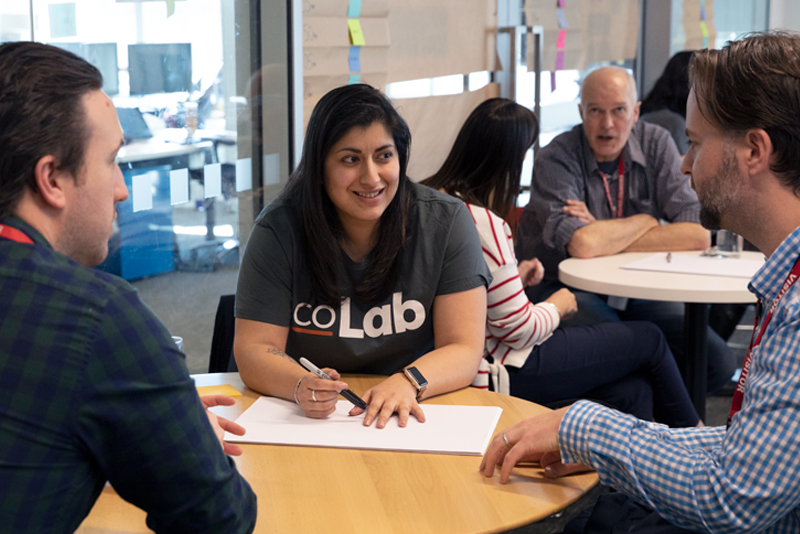 The Australian Government’s new innovation hub, co-Lab, is dedicated to cross-government collaboration and how, with the right mix of ingredients, working together achieves greater and more enduring outcomes. Back in 2016, I was fortunate to work as a service designer on one of the then-Digital Transformation Office’s 20-week exemplars with the Department of Human Services working on Medicare Enrolments for Newborns. A multidisciplinary team of researchers, designers, developers, solution architects, policymakers and legal experts came together to follow the Digital Service Standard to deliver an outcome that had a tangible impact on people’s lives. This new service didn’t just digitise this paper form, but entirely removed the need for a Medicare enrolment form altogether. Parents simply provided their consent to allow hospital data to be sent to the Department of Human Services. This significantly reduced the waiting period for a baby to be registered, and triggered a policy change to better meet parents’ needs. But reaching that outcome wasn’t simple. Collaboration isn’t just about putting together a team and giving them a problem to solve. You need commitment and the willingness to participate, followed by a shared understanding of the problem space and what the agency is trying to achieve. During the newborn exemplar all team members, no matter what their specific role or expertise, carried out contextual research together. This helped us all build empathy and develop a deeper understanding of what parents and hospital staff were dealing with. For some, this was a brand new experience, having never before had the opportunity to speak directly with the people they were building services for. Regular design jams were held to explore ideas from different perspectives. These sessions helped the team form a sense of collective responsibility and foster a transparent work culture. There’s no doubt that exposing team members to hands-on research experience accelerated the delivery of a better service. Being able to test, experiment, debate and work on a level playing field with peers made a huge difference to our ability to work together. Over the past year my team and I have had many conversations with government agencies. Government leaders tell us they want their people to have these same collaboration opportunities. They want teams to develop new digital skills, better understand the Digital Service Standard and take faster steps towards delivering transformational outcomes. This is where the co-Lab comes in. We are very excited to introduce co-Lab to you. The first space is in the DTA Sydney office and includes a team of digital specialists dedicated to supporting collaboration and encouraging experimentation through immersive experiences. co-Lab offers different experiences — from single day training and community events to longer term residency programs. You can read about our service offering. This shared environment will help broaden the conversation across different agency teams by providing a space for us to connect and learn together. To celebrate the launch of co-Lab, we kicked off a series of free workshops for government leaders and practitioners. We had over 80 participants from across Federal and State Government attend the workshops facilitated by our ‘thinker in residence’ and digital innovation specialist, Peter Bradd from the Beanstalk Factory. The workshops explored the connections between culture, innovation, collaboration and accelerated digital transformation. co-Lab will be hosting and running regular workshops and events throughout the year, please visit our Eventbrite page for dates and locations. Meera Pankhania is the Head of Service Design and co-Lab at the DTA.